Check the drop down on this page and you will find a lot of interesting information. I’ll be posting pages consisting of 5 main dinner dishes, some weeks include a shopping list that you can use to help you shop clean during dinner the following week. Read about what I suggest for breakfast, lunch and snacks. I will be posting a few recipes each week on those pages as well, so come back often and check them out. 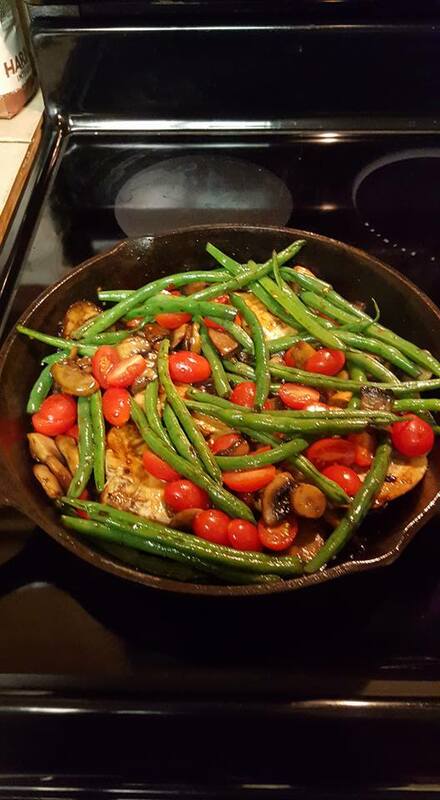 Pictured is One Pan Balsamic Chicken. I have the recipe on next weeks menu. Watch for the weekly recipes and shopping list to be posted by Thursday of the previous week in order to give you time to shop. Other things I will be sharing are the dangers of today’s modern food processing. Our foods are GMO’s and full of toxins. It’s a shame it has become so bad that we must learn to read labels and do research into how our food is made and processed to know what we are really eating. Another subject I’ll take a bit of time on is processed sugar, salt, consuming bone broth and how good organic pasture raised meats are for you. It is my intention to help you by providing information that may help you to understand this. I also want to help you learn to juggle life and what comes with it and all the while sharing easy recipes so you can cook and provide great CLEAN MEALS for you and your family! Let me help YOU make healthier choices, it’s coming straight from my heart. It’s what I do for my own family.